MILWAUKEE, WI--(Marketwired - Dec 6, 2016) - The holidays are a time for family and friends to gather, celebrate special traditions and spread joy. However, while the holiday season may be the most wonderful time of year, it is also considered one of the most vulnerable times too -- with more than one million North Americans traveling during the holidays1 and a whopping 73 percent of consumers2 concerned about items being stolen from their homes while they are away. "It's easy to get wrapped up in the spirit of the season and forget about simple security precautions we should take on the home front," said Rebecca Smith, vice president, marketing for The Master Lock Company. "Consumers should be aware and prepared for potential safety threats to ensure nothing puts a damper on their family's time together during the holidays and beyond." The Master Lock Company provides consumers with safety measures to keep their families, homes and possessions protected during the holiday season. 1. Keep an Eye on Your Valuables - Take extra security precautions throughout your trip as the risk of opportunistic theft increases in crowded public spaces like hotels, airports and train stations. 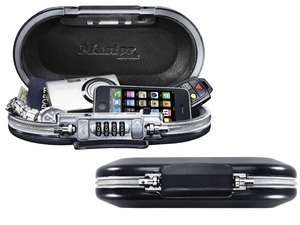 Keep your cell phone, credit cards, money, keys, jewelry, passport and other small valuables locked up and secure inside the Master Lock 5900D SafeSpace. This compact and versatile mobile safe helps keep your valuables protected while you are on-the-go and features a durable cable, which can anchor the safe down to a fixed object or serve as a carrying handle. 2.While Away -- Safely Store Holiday Presents - Avoid advertising your home as a target with gifts visible through windows and doors. Instead, keep these items protected by placing the higher-ticket items -- like tablets, watches and jewelry -- in a safe or a cabinet locked with the Master Lock 4400D Bluetooth Padlock. 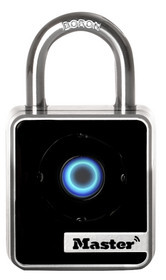 This innovative padlock can be operated with your Smartphone versus a key or combination lock and also makes the perfect gift for tech minded children, teens and adults alike. 3. Enjoy the Holidays -- Worry-free - While traveling, designate a neighbor to watch your house and get your mail and newspapers to avoid a pile-up -- a red flag that someone is away. Giving a trusted person access to your home while you are away is as prudent as storing your important documents in a SentrySafe Privacy Lock File (HD4100). This safe holds standard sized hanging file folders for easy organization of important paperwork and documents. It also protects against fire and water3 and is ETL verified for digital media protection -- so you can be prepared for any situation. 4. Protect the Home from Theft - According to the FBI, 400,0004 burglaries happen in November through December each year. Simple security measures can help protect families against home invasion. Master Lock 265DCCSEN Security Door Bar provides an additional layer of protection to homes by securing entry doors and sliding glass patio doors. Also, consider taking extra precautions such as installing a home alarm system, using exterior lights and purchasing interior lights with timers to give the illusion that someone is home while you are away. Additionally, avoid luring in a thief by displaying empty boxes at curbside that held expensive gifts, such as a new plasma TV, in plain sight at trash day. The Master Lock Company is recognized around the world as the authentic, enduring name in padlocks and security products. The Master Lock Company offers a broad range of innovative security and safety solutions for consumer, commercial, and industrial end-users. The Master Lock Company LLC is an operating unit of Fortune Brands Home & Security, Inc., a leading consumer brands company. Headquartered in Deerfield, Ill., Fortune Brands Home & Security Inc. (NYSE: FBHS), is included in the S&P 500 Index. For more information about The Master Lock Company visit www.masterlock.com. The Master Lock 4400D Bluetooth Padlock is an innovative padlock that can be operated with your Smartphone versus a key or combination lock. It also makes the perfect gift for tech minded children, teens and adults alike. Keep your cell phone, credit cards, money, keys, jewelry, passport and other small valuables locked up and secure inside the Master Lock 5900D SafeSpace. This compact and versatile mobile safe helps keep your valuables protected while you are on-the-go and features a durable cable, which can anchor the safe down to a fixed object or serve as a carrying handle. Master Lock offers additional protection beyond traditional door and window locks for sliding glass and patio doors with the added strength of a Master Lock 265DCCSEN Security Door Bar. It is a heavy duty, dual function security bar that adjusts to fit standard hinged and sliding doors. Store important documents in a SentrySafe Privacy Lock File (HD4100). 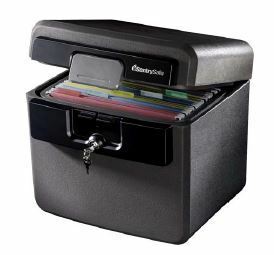 This safe holds standard sized hanging file folders for easy organization of important paperwork and documents. It also protects against fire and water and is ETL verified for digital media protection – so you can be prepared for any situation.